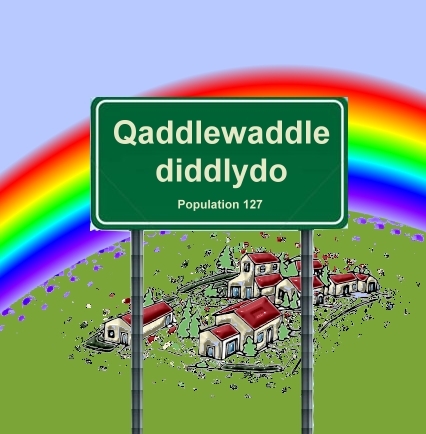 Qaddlewaddlediddlydo was a sleepy little town. Population: 127. It had a service station that sold a few basic items of groceries. The town was called “Qaddle” for short. Visitors frequently put a U after the Q, but they were quite, quite wrong. No one knew the origin of the name, and no one had thought to ask Madge Brunton. Madge was 94 and had lived in Qaddlewaddlediddlydo all her life. No one had thought to ask until Isabel Gatehouse from the city decided to interview Madge. Isabel was doing her doctorate on the origins of local place names, and, of course, Qaddlewaddlediddlydo feature near the top of the list. Would you believe it? It was at that precise moment that Madge suffered a stroke. That is why, even to this day, no one knows the origin of the name Qaddlewaddlediddlydo.